Can I receive UK free-to-view TV in Southern Spain? You may be able to get five, but you will need a Sky card to decode it. Please recheck your understanding of copyright issues, that it may be received in a private home is irrelevant! Note that I was the Senior Technical Training Manager responsible for teaching all about reception, installation and maintenance of all satellite system for then the worlds largest TVC rental company, so I know something about the issues. I have worked in the TV industry since 1960 so again have considerable experience. Before trying to carry a large dish and signal strength meter around any country, you should inspect the freely available satellite footprint maps. There are some on this website and SES (the owners/operators of the Astra satellites) also publish such maps and they are on the internet. Only when you know there is likely to be a signal of sufficient strength to be worth testing should you ten resort to a dish/meter set-up to confirm the availability of strong enough signals. You cannot connect two LNBs in parallel, it doesn't work that way. Using more than one amplifier in series is not good practice, if you need extra gain then use and amplifier with an inherently higher gain. There are many instances where signals just are not available in the area. 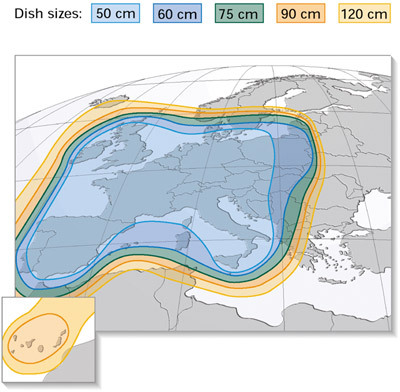 For example, someone asked about Freesat reception in India - that is just not possible as the footprints do not reach that far East nor at any measurable signal strength so it is not even worth trying pre-amps. hobby or want to try. Sorry,i don't wish to be rude but i also know about weak signal reception. I'm afraid it doesn't appear as if you are aware of the key points of good satellite reception. To receive the signals you need an LNB suited to the wanted signals with a reflector that is correctly shaped to focus the very weak signals into the LNB. A garage door is exactly the wrong shape to focus the signals onto the LNB. Parabolic reflectors are designed specifically to focus the signals correctly and avoid extraneous unwanted radiations from outside the area of interest, namely line of sight to the wanted satellite(s). A north facing garage door is looking in exactly the wrong direction for any geostationary satellites when viewed from the Northern Hemisphere, the satellite all being 'parked' in geostationary orbits above the Equator, which is south of the UK. 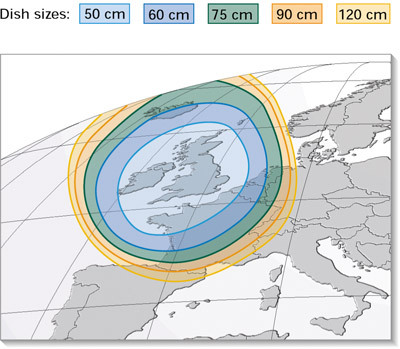 The Astra satellites, used by Sky and Freesat, are roughly above East Africa so the dish needs to be aimed at that orbital position, so the azimuth of the dish is *not* 28 degrees east - you have to allow for your latitude and longitude as well as the exact satellite position. Anybody can try anything if they know how safely.